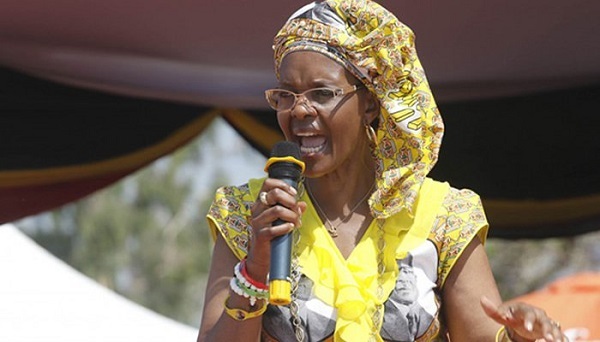 ZIMBABWE – NewsDay is in Maphisa where First Lady and Zanu PF Women’s League boss, Grace Mugabe is conducting her fourth political rally during the current leg of her ‘Meet the People ‘tours’. Previously Grace held rallies in Mbare, Mberengwa and Murehwa. 12:40 “The Western countries are now begging China for assistance yet they used to mock Mugabe for doing the same.” Grace says China has been Zimbabwe’s all weather friend since liberation war. 12:30-12:40: Grace alludes to President Robert Mugabe ‘s State visit to China and presented ZimAsset where he placed emphasis on food security. In Brazil Mugabe also appealed for assistance with food security. Assistance came in the form of tractors from Brazil. Grace cites food security as being key under ZimAsset. 12-25:1230 Absalom Sikhosana accuses NGOs of short changing people giving them rotten food handouts. Grace says non governmental organisations’ agenda is to turn people against Zanu PF .” Food handouts are not the answer to poverty,” she says. Grace urges the people to demand the removal of sanctions. She blames NGOs and hold them responsible for sanctions. 12: 20-12:25: Grace continues to invoke Joshua Nkomo’s name as a unifying force. Some people are walking out as Grace makes her address. The First Lady acknowledges drought in the arid province. 12:18: Not more than 2 500 people are at the Maphisa rally. Fired ex -Minister of Sports, Arts and Culture Andrew Langa is in attendance. 12:15: Grace repeats Zanu PF rhetoric on sanctions: She blames sanctions for the closure of industries in Bulawayo. According to her Zanu PF was falsely accused of human rights violations by Western countries. 12: 05 : Grace explains the suffering Nkomo went through to liberate Zimbabwe from colonial rule. She thanks Nkomo for the sacrifice they made through their selfless dedication to the struggle. 12: 03:” We came to the province but we were in Gwanda in 2013 campaigning … and won all 13 constituencies” Grace says. She says the province is historically important because the late Vice President Joshua Nkomo hailed from Matabeleland South. In order for Nkomo’s soul to continue to rest in peace we must maintain unity. 12:00: Grace takes to the podium and is going through protocol. 11:37: The Zanu PF National Political Commissar Saviour Kasukuwere takes to the podium. 11:37: The State Security Minister Kembo Mohadi is in attendance. Tomorrow the First Lady is expected to touch down in Masvingo for her fifth Zanu PF rally. The First Lady’s rallies have turned into donating frenzies since she has been distributing various farm implements such as tractors and food items. Grace ‘s speeches leave no stone unturned as she often launches vitriolic attacks on former Vice President Joice Mujuru and her allies, and the private media.